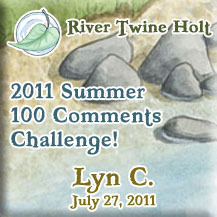 (2011 Summer Comments Challenge) Coyote is left to cubsit his baby sister. What could possibly go wrong? "Oh, there you are!" Willow said as she crawled into the cunningly hidden cave. "I'd never have found you without the sending help �" The bee-charmer stopped short, and her smile faded. She looked pointedly at two-and-a-half-year old Laughter, who was waving cheerfully from where she sat playing with her dolls, then back at Coyote. "Rut you! If you called for me to do your babysitting for you, I'm gonna smack you so hard you �"
"No, no, I don't need your help with the little mop-cap there," Coyote said, waving breezily at little Laughter. "She's got her toys, she's no trouble at all. No, I need your help with someone else. We've got bigger fish to fry." Willow's smile returned, only this time it was wickedly crooked. "Oh, you wouldn't dare.... Tonight?" Coyote's grin was feral. "Tonight," he replied, with an almost savage light in his eyes. "What've you got in mind?" "Sit down, and let me bounce the ideas off of you." Willow immediately moved to take a seat beside Coyote on the ratty marshbeast hide that served as the sole rug in Coyote's current secret lair. The stone cavern was only the latest of Coyote's hideaways � or if he'd used it before, Willow had never been invited inside. The place was crowded with Coyote's assortment of tools, oddities collection, and general packrat nest of debris. There were some makeshift shelves, crowded with baskets and jugs of who-knew-what (Willow knew better than to ask). Drying herbs, fish heads, dessicated amphibians, and even what looked like half of a muskrat skeleton dangled from the ceiling, and the entire cave had a fetid undertone of must, musk, rancid tallow, and unwashed wolfrider. Willow glanced over at Laughter, who was perched on a badger pelt near one set of shelves. The cubling was entertaining herself by making her reed dolls jump in unison over the poorly-preserved and molting bulk of a stuffed goose lure. "Tonight cannot be just allowed to happen," Coyote said. "Agreed," Willow said with enthusiasm. 'Tonight' was going to be Whitestag's victory feast, hosted in his honor by the families of Honey, Cider and Nightstorm. The three had been picking yellow chanterelles along with ripe berries in the leather-leaf thickets near the summit of Home Ridge, unarmed save for their belt-knives. They had been attacked by young black bear, which must have thought they looked like a richer meal than the leather-leaf berries. Whitestag had been hunting marmot nearby. He had heard Honey's shrill scream and had raced to the rescue. The way Cider told the story, all three berry-gatherers were already safely up a tree by the time Whitestag and his wolf-friend arrived, and could simply have out-waited the young bear, which was too busy being harried by their wolf-friends to climb up after them. But the way Honey and Nightstorm told the tale, Whitestag had charged fearlessly to their rescue and slain the rampaging beast with a single heroic arrow-shot. Certain tragedy had been averted, and Whitestag was the tribe's champion of the hour � which Whitestag accepted with a self-satisfied humility that made Willow want to drink bile. Willow was grateful that her kinswomen had not been harmed. It was just that kudos in any form for Whitestag stuck like a bone shard in Willow's craw. True Edge and Snowfall's son already felt his piss didn't stink like everyone else's. He didn't need an honor-feast to further swell his over-stuffed sense of self. Coyote had been using a tiny bone needle to drill into a robin's egg. He set his project aside carefully, then scrambled to pick up a wide woven-grass basket. He began to unpack it as he spoke, inspecting each fragrant, wrapped herb bundle as he lifted it out. "Everyone's bringing something," he said. "Doeskin and Dreamberry have been baking their favorite honeycakes; Cider is promising to bring some special brew... it would be easy to slip something into his wine that's guaranteed to make his bowels leak..."
"With the entire tribe gathered? Too many witnesses," Willow said, shaking her head. "No control, either, of who might share a taste. What do you want to bet Honey will be perched on his lap for the whole feast?" Coyote gave a wicked snort. "Two birds, one stone!" He finished pawing through the basket and set it aside, apparently without finding what he was looking for. He frowned as he examined the contents of a shelf critically. "Where did I leave that pigweed? Anyway, you're right. It's too risky to lace his food or drink with something, isn't it. Not enough time to build a good quillpig-basket trap... you still have that bluestone necklace? With that big center stone the same color as his eyes? You know he's partial to it. We've just about enough time to whip up some good blister-juice..."
"I'm not giving my favorite necklace away, certainly not to Whitestag!" Willow said. "Besides � it'll be kind of obvious, won't it, who's responsible when the blisters rise up?" Coyote winked at her. "Not if you've just lost it in a dice game to Rhythm. Whitestag just saved Rhythm's lifemate, he'd hand that bit of pretty straight over to Whitestag at the merest bat of Whitestag's oh-so-thick-and-golden lashes." "If Honey's got lap-claims, she'll wheedle it away from him," Willow observed dryly. Coyote shrugged. "Huh. Maybe so. There's got to be something we can spring, something that'll bring the great hunter down a few pegs �" Coyote glanced back toward Willow as he spoke. His smokey-green eyes suddenly went round, and he lunged at her. "No!" Willow flung herself aside, only realizing after she had done so that it wasn't her Coyote was leaping for, but rather, little Laughter behind her. Willow twisted around to look, and saw that the girl had opened up a wooden box, on the outside of which was painted a bilious-green troll face. The box was filled to the brim with the dried husks of iridescent green-blue beetles. Stink beetles. The big kind, the kind you could only gather off of the dung of the huge herds of thunderfeet that roamed the grasslands of the east. They weren't dung-eaters per se � no, they fed off of the fat dung-eating flies and offal-rolling beetles who liked to bury thunderfeet droppings. Laughter had stuffed her mouth full of stink beetles, and was munching away on them merrily until Coyote roughly snatched her up and shook her. The box dropped, showering the floor around with them with shiny green-blue husks. "No no no no no," Coyote cried; there was sheer fright in his voice, something Willow was not sure she'd ever heard out of him before. "C'mon baby, spit them out, spit them out..."
Laughter did exactly what any self-respecting wolfrider cub would do in such a situation. She gulped down the remaining mouthful of her contested treat, sucked in a breath, and howled with outrage at such mistreatment. Willow pushed herself to her feet and rushed to join Coyote, who was now crouched with a squirming, kicking Laughter clutched against his chest. "How many of those did she eat?" "Don't know!" Coyote still sounded frightened. "C'mon, sweetie, open wide, let your big brother look into your mouth �"
Laughter shut her jaws tight with a snap and looked warily up at Coyote, as if expecting him to pry her jaws open. "Mmmmmmph!" she replied, squirming like a big tadpole in his arms. Coyote tried tickling her belly, getting in a quick pat there to see how distended the girl's stomach might feel. Laughter giggled and squirmed harder, then let out a tiny, delicate little hiccup. Coyote's face, which had been a whisker away from Laughter's own, recoiled with a look of horror. He sat down hard. Moments later, the shock wave of Laughter's breath reached Willow. The bee-charmer made a rude noise and rushed to cup her hands protectively over her offended nose. "Oh, rut me!!" Willow moaned. "That can't be her! It smells like something died!" Coyote's face was wide-eyed with expression of mixed horror and wonder. "Something three days dead," he agreed. "In the summer kind of dead, belly-bloated and fit to burst!" Mesmerized by the look on her big brother's face, little Laughter smiled and giggled. Seeing Coyote's eyes start to tear up at a second whiff of stinkbug-breath, Willow pinched her nose closed and began to back away toward the cave door. "I just remembered something I've got to do �" she said, waving vaguely toward escape. "Not for the big feast, I hope," Coyote called after her absently. "Because we've found our secret weapon..."
Rainpace came home close to midnight from a long day of walking his trap-lines, and was surprised to find the wide meadow flanking the river crowded with his tribemates. Musicians Rhythm, Cider, Moss and Kestrel were gathered at one end of the meadow, playing their instruments, while others danced merrily in the grassy clearing, accompanied by a vibrant flutter of Preservers overhead. At the other end of the small meadow, Cloudfern had shaped an old stump into a high-backed, armless chair, across which had been thrown a pair of full snowcat-fur hides. Whitestag reclined in that seat of honor now, with Honey perched on one side of him and Nightstorm on the other. A fresh bearhide was stretched out on at the grass at his feet; the bear's head was resting in the center of the hide, with a stout stick propping open its fanged maw. Baskets and platters of food surrounded that gummy-eyed centerpiece, and Honey and Nightstorm were taking turns feeding Whitestag choice delicacies from the feast below them. Lionheart, Whitestag's wolf-friend, sat curled around the chair of honor, within reach of the feast but gamely waiting for his own share to be presented. Rainpace grabbed a wineskin that was being handed past. He took a quick pull from it, passed it on, then dropped onto a sitting-fur beside Willow at the edge of the clearing. �Who went and made him chief?� he muttered to Willow, with a jerk of his chin toward Whitestag's seat of honor. 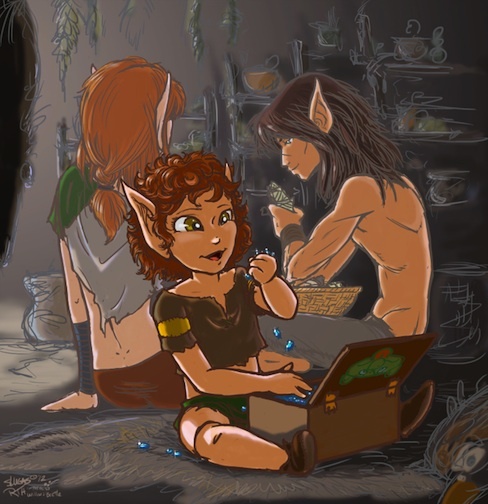 Willow simply grinned back at him and offered him a bite from her wooden bowl, which was crowded with choice bits of this and that from the feast arrayed at Whitestag's feet. �Just sit back and enjoy,� she replied, sounding smug. Rainpace eyed his friend, not liking her too-innocent tone. He plucked a chunk of honeyed smoked salmon from the offered bowl and nibbled on that as he looked around the celebration again. �Where's Coyote?� he asked, not seeing his childhood friend anywhere among the dancers or musicians. �Oh, he's about somewhere,� Willow replied airily. Too airily. Rainpace gave her the hairy eyeball, knowing the smell of incoming trouble when he caught it on the wind. Willow smiled back knowingly at him, not showing a glimpse of teeth � a high sign that her lips were sealed on the matter. Rainpace slid another glance back toward Whitestag, who was clearly enjoying himself as two comely females plied him with food. Whatever was afoot, True Edge's son was clearly oblivious. Rainpace chuckled and settled back as advised, helping himself to a share of what Willow was eating and ready to enjoy himself, whatever it was his best friends were planning. The season was changing, enough that there was a bit of chill in the air this night � in Rainpace's opinion any excuse was a good excuse for a party, when you only had a few summery nights left before things got all wet and miserable for the rest of the year. Rainpace helped himself to another piece of candied salmon, then moved on to a bite of garlic-crusted roasted camas root, followed by a crispy honeycake. The lively music was infectious, and he was thinking of joining the dancers when he spotted Coyote's arrival. His childhood friend was not alone. Coyote was carrying his little sister Laughter as he stepped out into the dancing meadow. With the little girl's arms wrapped around his neck, Coyote slow-stepped through the swirl of dancers, whispering in his sister's ear as Laughter clung to him. The child was beaming beatifically. Indeed � the sight of the two siblings together was so unexpectedly, sweetly innocent that Rainpace couldn't help but do a double-take, and a swallow of honeycake went down the wrong pipe. �Camouflage?� he asked Willow, after he'd finished coughing. Willow's smile remained close-lipped, but the sly tilt of her chin was all �just wait and see.� Rainpace snorted with amusement, and settled back to do just that � wait and see what was to come next. Rainpace was left almost wondering if he'd misjudged Willow's nonverbal cues, as Coyote continued to just single-step and sway, murmuring the whole while in Laughter's tiny ear. Then Coyote freed one hand and pulled a handful of something from his badger-skin sporran. He began to feed something small and glittery to the girl, which she took to with enthusiasm. Rainpace slid another glance at Willow. She had gone innocently blank-faced. Rainpace smirked to himself and returned his attention to Coyote and Laughter. Coyote was putting Laughter down now. The girl was dressed up in a bright yellow websilk scarf that had been turned into a wrap-dress, tied at the shoulder in one large, bright bow. Coyote held her by one hand as she giggled and spun on her toes in front of Whitestag's chair of honor; Flash and Fletcher pointed the cubling's dance out to others as Laughter bobbed and spun, her toddler's balance held steady by a firm grip on Coyote's hand. Whitestag noticed as well, and made a show of directing everyone's attention to Laughter's topsy-tipsy performance. �Who saved the day today?� Coyote asked cheerfully, with a benevolent smile for his sister. �Who is our hero?� Coyote continued. �Who do we love?� Coyote asked. �And how do we show him we love him?� Coyote prompted. �We wuv him and we hugs him and we kissy him!� Laughter crowed. There was more applause and cheers as Coyote took both of Laughter's hands and swung her over the feast platters display on the bearhide. He let her go at the base of the honor-chair, and Laughter gleefully began to climb up onto Whitestag's lap. The hunter laughed and welcomed her with open arms. As Whitestag reached for the little girl, Lionheart was the first to react. The wolf's ears flattened and he shied away from the chair as though wasps had stung his nose. Then Laughter was on Whitestag's knees. Nightstorm was the next to recoil. She sat back and scooted off of the edge of the honor-chair where she had been sitting, her expression shocked. Seconds later, Honey all but fell off the honor-chair, her eyes wide with horror. Then Laughter had her chubby toddler arms wrapped around Whitestag's neck, and she hugged him tightly as she began to land big, wet kisses all over his face. Whitestag's eyes were already round with shock, but now they began to bulge in horror. It was obvious that the proud hunter wanted to dump the child off of him � but there was no polite way of doing so, not with the eyes of the rest of the tribe on them. Instead, Whitestag gulped deeply as though about to take a long dive, and then held his breath. Lionheart, showing himself to be a wise wolf indeed, fled the scene with his tail tucked, while both Honey and Nightstorm were moving quickly for safety. Coyote began to laugh uproariously, and beside Rainpace, Willow began to laugh as well. Other tribemates were looking from Whitestag and Laughter to Coyote, beginning to recognize that some grand prank had been had, but not clear yet just what it had been. Rainpace brushed himself off and stood. He wasn't sure himself what, exactly, Coyote had done � but very clearly little Laughter had been the delivery source. Neither Coyote nor Willow looked like they were going to rescue their victim, now that an adoring Laughter had been set loose on him. And Whitestag was nothing if not as stubborn as his father, True Edge. The hunter would likely fall out of his chair from lack of air � and if Whitestag�s fall didn�t hurt him, it could hurt little Laughter. Rainpace shot a dark look at Coyote, trying to assess what his friend�s next step was. But Coyote failed to notice � he was too busy laughing uproariously at how his prank was playing out. Rainpace decided to take pity on the tribe's hero of the day. The trapper scooped up the nearest wineskin as he passed it toward the chair of honor. He stepped over the bear-head, dropped the wineskin in Whitestag�s lap as a trade, then reached to pluck Laughter away before the hunter's lungs burst. The little girl's grip was surprisingly strong, and Rainpace was pretty certain that she took a handful of Whitestag's white-gold curls with her as she went. He expected to feel a wet and soggy diaper on her rear end, but to his surprise, she was dry. Guessing the second zone of danger, the trapper was careful to keep the little girl's face pointed away from his own, holding her so that her back was against his chest. Even so, a fetid whiff drifted back and struck him hard enough to leave his eyes watering. With a firm hold on the squirming, laughing cubling, Rainpace headed for the riverside to see about reversing whatever the stink-delivery deployment method was that Coyote had devised. �We wuvva yous!� Laughter chortled as Rainpace carried her away.